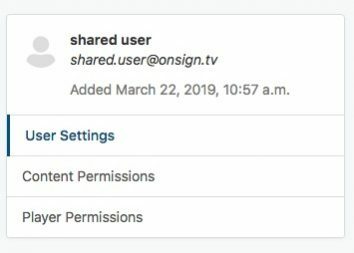 In your OnSign TV account, click on your username and hit “Settings” from the drop-down menu. Then, select “Users” on the sidebar menu. Click the edit icon (button below "Action") beside the user for whom you want to expand permissions. The loaded page will show the basic info of the user. You can modify name, password and account type, as well as set permissions you want to apply overall. Player Permissions: Allow the user to see the players or player groups you want and specify which actions they can perform on them. 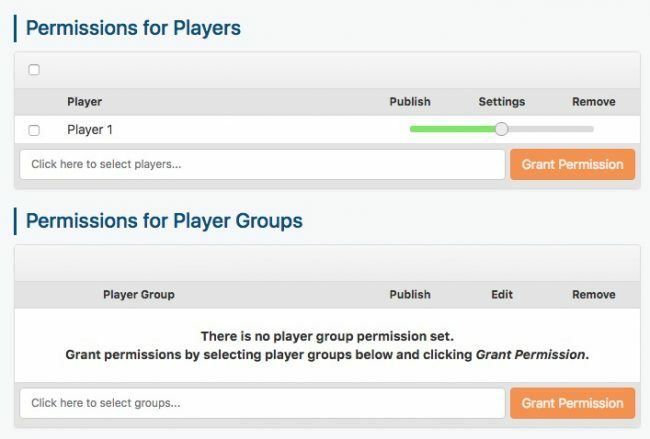 Type the player name in the text field and confirm with “Grant Permission”. 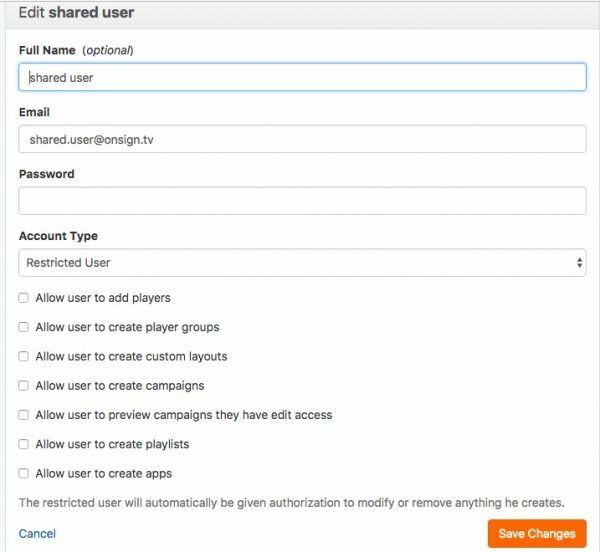 You can even choose whether the user can only publish to the player, adjust the settings or even remove it from the account. Content Permissions: Choose what content the user can have access to and what they can do with them. Distinguish between use, inspect, modify, and delete. Initially, here are only a few content folders listed. To share more content folders, you have to click on the"Share" button on the top-right corner. Shared Content: A pop-up window with all your folders comes up. 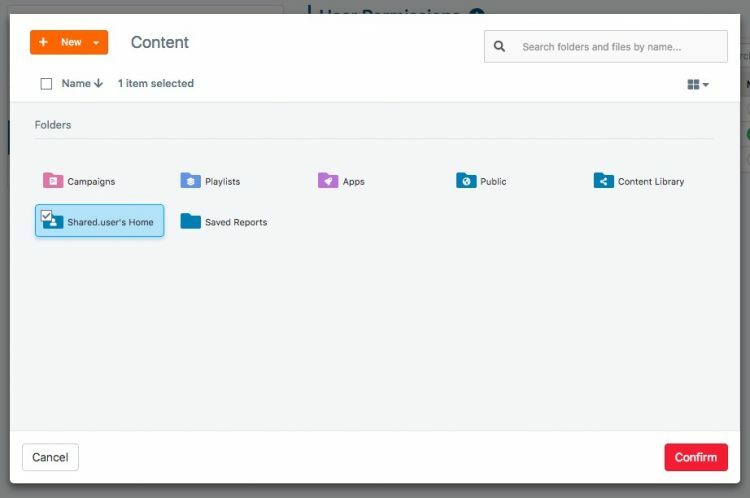 Select the folders you want to share with the new user account, so they can use the content, playlists, apps and files within it. Remember that if grant the user permission to modify an app, it will affect campaigns they do not have access to as well. You can remove permissions any time by switching the green switches off. Off switches are shown in grey. If you switched all switches to off for an item, an alert pops up informing you that you take away all permissions for the item from the user. 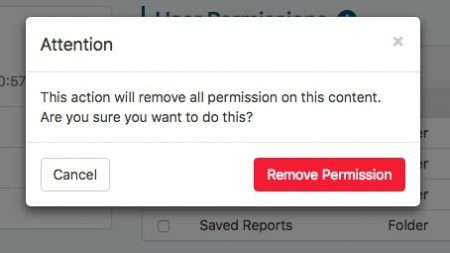 Confirm with “Remove Permission”. To remove permissions from players, you have to select "Player Permissions" from the left-hand sidebar. Mark the player you want to remove permissions from and confirm with clicking the red "Remove" box in the header.